I’m looking for a Jelly Cat Kitten Starry Nights pink donkey with with dark pink/red stars. It’s for my best friend’s 9 year old daughter, Freya. 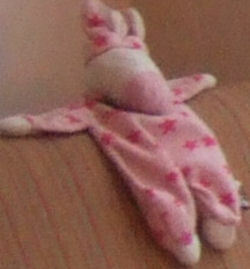 She was given the Jelly Kitten Pink Starry Nights Donkey toy when she was only a couple of days old by her Daddy. It is her favourite soft toy and her comforter, which she sleeps with every night and takes with her whenever she is away from home or has to go to the Doctors, Dentist etc. She has named him Flapjack, because he has a flat body, and unfortunately he was lost when she went on holiday in a caravan during the Easter holidays. We have tried contacting the owner of the caravan and the caravan park directly, but they have not been able to track him down. We keep telling Freya that Flapjack is still away on his holidays, but she just wants to know when he will be back and is waking up at night in tears because he is not with her. I have contacted the company that made him, but he is now discontinued, and I have scoured the internet looking for him, but to no avail. It would be so fantastic if I could track down another Flapjack to give her and see her face light up again. Many thanks for your help, and I will keep my fingers crossed that someone knows where I could find one.